Atlantic Offshore has signed a contract with Statoil to operate two Platform Supply Vessels (PSV) from 2014. The agreement, which consists of two contracts, has a length of six years with an option for a further three years. The vessels will be built in Norway and ensuring important jobs in the shipbuilding industry. Overall, the agreement is the largest Atlantic Offshore has ever entered. The vessels will be built in Wartsila design (VS 485 MKIII L). These are among the largest PSV vessels in the market, approx. 90 meters in length, and with a loading area of ​​1050 square meters. The newbuildings will have low energy consumption and be economical in operation. Both vessels will hold the highest standards with advanced technology, meeting all certifications and environmental specifications. – We will use the Norwegian shipbuilding expertise when building the vessels, securing important jobs, he said. This contract is the first PSV-contracts entered into between Statoil and the company. Previously, Atlantic Offshore holds agreements in Field Support Vessels with Statoil. The new buildings will initially operate in the North Sea when they are in operation. – We perceive the agreement as an acknowledgment of what we have achieved in recent years. The company has invested significant resources in a modern fleet, which now gives noticeable results, says Wareberg. The company will shortly decide on where to build the vessels. 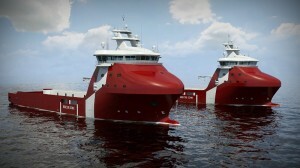 During 2012 three new buildings will be delivered to Atlantic Offshore.